Because some people don't bother to read and leap to conclusions from the title, please understand that the coins are fine. Other than one small scratch, the packaging is fine also. What I'm complaining about here is shoddy packing and disrespect for the coins and the customer. 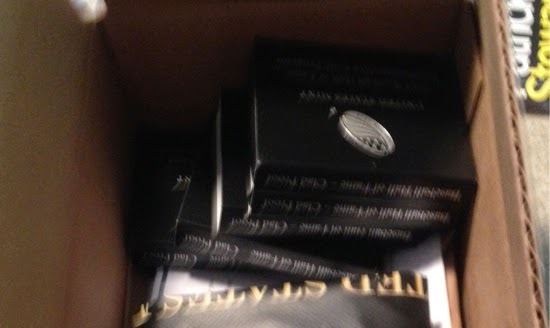 Yesterday I received part of my Baseball Hall of Fame proof coins from the U.S. Mint. These were not the silver or gold, but only the clad composition. United States Mint proof coins feature sharp relief and a mirror-like background. Their frosted, sculpted foregrounds give them a special cameo effect. Proof blanks are specially treated, polished, and cleaned to ensure high quality strikes. The blanks are then fed into presses fitted with specially polished dies and struck at least twice to ensure sharp relief. The coins are then packaged in a protective lens to showcase and maintain their exceptional finish. "Specially treated" - remember that. Here's what the box looked like when I opened it. Upon lifting off that piece of packing paper, this is exactly what I saw. You may be able to see that there is another thin layer of packing paper at the bottom. That dark colored thing with the gold icon is a "mint bag"- something they give away with larger orders. Just what everyone wants: a shopping bag that screams "I have valuable coins!". I've had two others like this and got rid of them as quickly as I could! But notice the blue boxes toward the back. That's as I saw them after lifting off the top "packing". Nothing packed around them, they were free to bounce around all they wanted. Now yes, the coins are well protected inside plastic lenses inside those blue boxes. But still: these are presentation pieces, specially minted and handled. What message does it send when they are carelessly tossed into a box like this? To me it says "Here's your crap!" 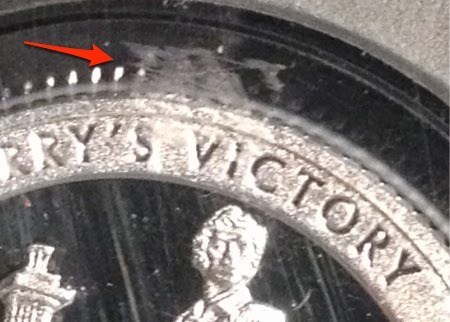 That rubbing was on the inside of the cases, plainly caused by the coins moving against it during shipment. Here's your crap. 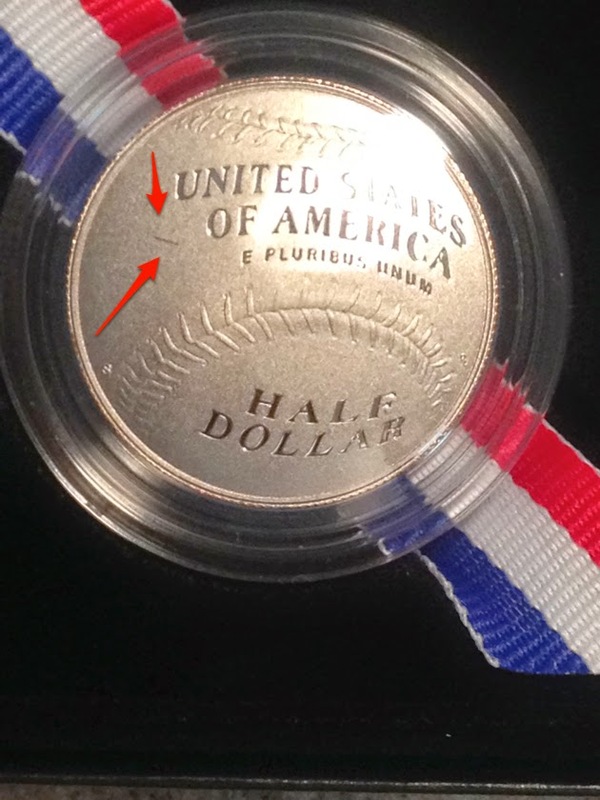 Fortunately the lenses of the Baseball coins seem to be a tighter fit, so they didn't suffer any damage. Or did they? They hadn't been hurt by whatever jostling insults they had to endure in shipping. But..
Do you see that? It's a scratch. 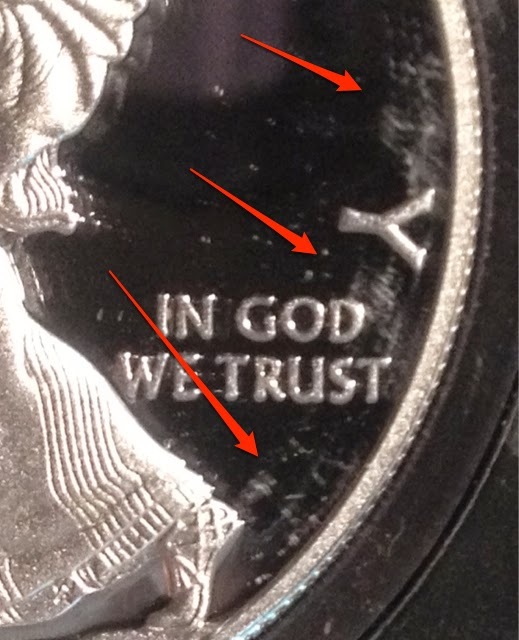 Oh, not on the coin, but on the protective lens. Specially treated is for coins, not lenses, apparently. Thanks for your money, here's your crap! That didn't happen in shipping. That happened before that and is large and obvious enough that it should never have got past inspection. But hey, we are way behind - we gotta ship this crap! I haven't yet thoroughly examined the rest of the coins. There was nothing that jumped out at me like this, but it won't surprise me to find other evidence of sloppiness.